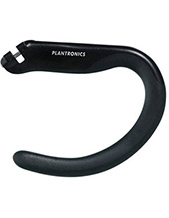 Answer VoIP calls by simply putting on the Plantronics Blackwire C725 USB Corded Stereo Headset with Smart Sensor technology. Another technology offered with this headset is Active Noise Canceling, which blocks out distractions so you can use it in noisy environments. It is also built with a cushioned metal headband that provides comfort and durability. 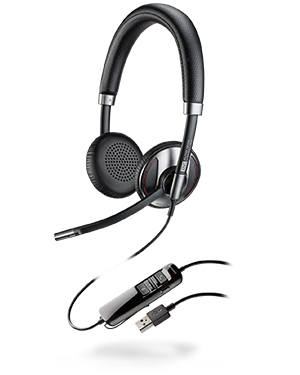 This Unified Communications headset is compatible with UC applications as well as softphones and connects to your PC or Mac via USB. You can use this headset for managing calls and immersing yourself in audio from music and multimedia with dynamic hi-fi stereo sound. To clearly hear calls, two cushioned earpieces utilize PC wideband and digital signal processing audio technologies to deliver heightened speech clarity. In addition, your voice is enhanced via a noise-canceling microphone. Intuitive inline controls on the cord allows you to control the volume as well as mute, answer, and end calls. 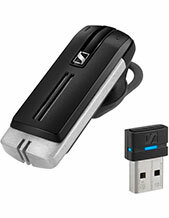 Additionally, this headset offers inline indicator lights and audio alerts that let you know if you are connected, muted, and the volume status. 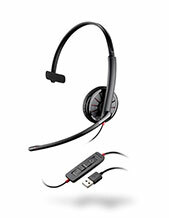 Included with the headset is a carrying case that protects the headset with foldable ear cushions when traveling.